I have west facing windows and these totally block the sun! Our SunSmart Dahlia Paisley Printed Total Blackout Window Panel offers a stunning and stylish update to your home, while embracing simple functionality. 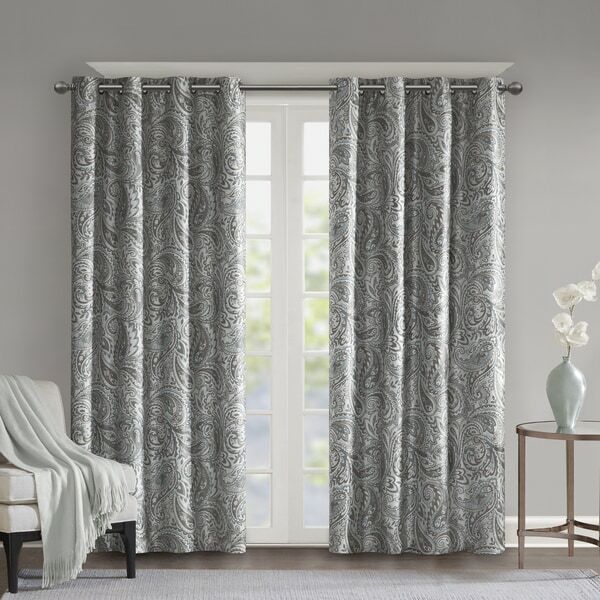 This curtain features a beautiful paisley print in rich and neutral hues, combined with a light sheen faux silk base fabric for an elegant and transitional look. An added full blackout lining blocks out all outside light and creates a maximum protective barrier against noise and intrusion to ensure the highest level of privacy. Using thermal technology, this window panel helps provide maximum energy saving by keeping your room cool or warm as needed. Grommet top makes this panel easy to hang, open, adn close thorugh the day. This 100-percent total blackout window panel is perfect for bedrooms, media rooms, or any private space, providing a lighting level of pitch black ambiance when fully closed. Fits up to a 1.25-inch diameter rod. OMG These are amazing!! They totally transformed the bedroom!! never been happier with a purchase!! They are PERFECT!!! Love the full light blocking and pattern is just beautiful! Another incredible luxurious curtain. This is a blackout curtain that beautifully reduces the temperature from the hot desert sun. I enthusiastically recommend thIs drapery. The shear elegance of the fabric and design adds a boost of class to any room in your home. Not only are they room darkening but they keep the heat or cold out as well. Great purchase! 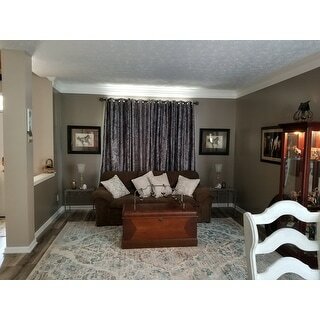 Curtains were great quality at an amazing price. The colors were perfect for what I was looking for. I found almost the same pattern on another site but they wanted way more money for them. These fit perfectly in my sitting room. I like this a LOT. White backing (required by my condo) and it looks gorgeous against my light gray walls. I may have to exchange it, though, because my roommate hates paisley and wants boring! Sigh. Live them. They block almost all the light, and the colors are great for lots of wall colors. When I paint to a neutral grey from the sandstone that the walls are now, they will still be fabulous. These curtains are absolutely beautiful. I bought a pair for every room in my house. They look and feel more expensive than drapes I've had custom-made. These curtains where darker than I expected from the picture. I wanted a lighter colored background so I did return them. The agent I called and talked with wasn’t the most helpful but did eventually return them. I like the colors, pattern and quality of the drapes. "Does Sunsmart make any matching balances to their curtains? Would love to match the master bedroom to the master bath. Thank you!" No there are not any matching valances available. "Can you clarify, are there one or two panels included. The header says a panel pair but in the description says one panel included in the set. Do you get one or two panels?" I apologize for the confusion, this listing is for a single curtain panel.